Although digital signatures were first procured in 1978, it was not until 1989 that it became marketed in a significant way. The Lotus Notes 1.0 was released that year, and it offered “encryption, signing and authentication using the RSA public-key technology,” which allowed the recipient to reliably determine if the document had been modified during the transmission process. This is important as signatures are invalidated if the document was changed after the signature was applied to it. Since then, the technology has been advanced quite a ways, and once the European Union passed the Electronic Signatures Directive, which stated that e-signatures were as legally binding as written ones, in 1999, that provided the impetus for more and more organizations to start providing this service. DocuSign jumped into the field in 2003 and still controls a significant majority of the market while RightSignature has been amongst its biggest competitors since it was founded in 2009. Both of these businesses have offices in San Francisco while DocuSign is also located in Seattle and RightSignature has a second office in Santa Barbara, Calif. The e-signature services that these companies provide is a pretty simple service on the surface: providing the ability to send an important document that needs signing to somebody and then have them be able to simply add their signature to it electronically before returning it. However, the competition between these top providers of the service is not as simple. For that reason, we will take a look at how these two companies compare in a number of areas, which things they do similarly and, more importantly, what sets them apart. Fortunately, the signing process tends to be pretty easy from the recipient’s perspective, regardless of who is providing the service. Once you have a document that needs signing, you use a company such as DocuSign or RightSignature to send a signable version of it over. This individual then looks over the document and, upon agreeing, signs it by, in most cases, either typing their name in the provided place or signing their name there by using the cursor. However, some differences do exist between these two companies when it comes to the signing process. Those receiving a DocuSign document may not realize it as sometimes these emails end up in their spam folder. Also, once a document has been signed, they are then forwarded to a page that invites them to sign up for the service, which can lead them to believe that this is a required step in the process. Additionally, the recipient may receive further messages from DocuSign, requesting that they sign up for the company’s services. However, you can ensure that some or all of these things do not occur by changing your account’s settings. Conversely, RightSignature offers a much more linear process, one that does not have the advertising aspect to it that going through DocuSign does. Also, this company provides a convenient option, the ability for the recipients to instead print out what you have sent them and fax a signed version of it to RightSignature instead. Both of these companies provide you with the ability to integrate with documents you have stored with file-hosting organizations such as Google Drive, Box, OneDrive and Dropbox. This gives you the ability to easily take a document from the cloud right into your DocuSign or RightSignature account. Several other companies that DocuSign works with may be viewed here. Meanwhile, RightSignature also provides add-ons with these websites. This is one area where DocuSign definitely wins out: provided information. Click here to see all of the different file types that they support. Conversely, RightSignature says on its FAQs page that it “supports PDF, Microsoft Word and TXT file types.” However, those with other types of files are asked to contact them to find out if they can be used as well. 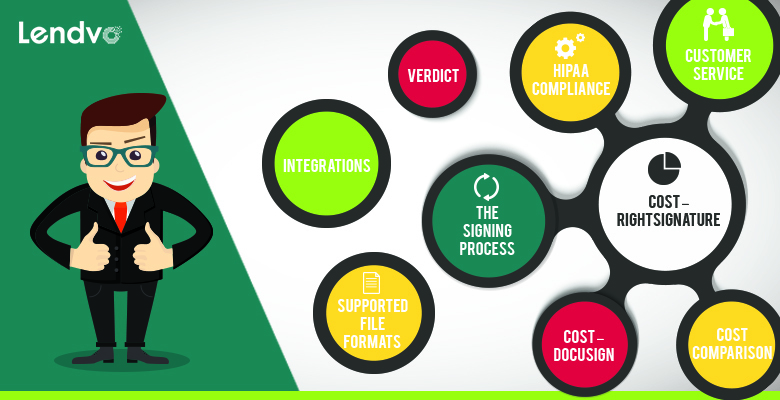 If being compliant with Health Insurance Portability and Accountability Act (HIPAA) regulations is essential to your organization, you will want to utilize DocuSign’s services as they offer the ability for those in the medical industry to procure legally-binding signatures electronically from their patients. This means that DocuSign provides user authentication, message integrity and non-repudiation. These features help prove that the correct person signed an unaltered document and that this individual cannot later deny having signed it. Conversely, RightSignature does not offer this feature. However, if your requirements have nothing to do with HIPAA, this should not be a concern as RightSignature’s offerings are normally legally binding in non-HIPAA situations. This is because both of these companies are compliant with the Uniform Electronic Transactions Act (UETA) and the Electronic Signatures in Global and National Commerce Act (ESIGN). DocuSign provides email ([email protected] and [email protected]), phone (877.720.2040 for sales and 866.219.4318 for general inquiries) and chat support to all of its customers and prospective customers. People in the latter category can also fill out their online form. Those who pay for higher plans receive faster and higher quality support while individuals who have signed up for the enterprise package, the most expensive and detailed one that DocuSign offers, will receive help through prioritized escalations and a personal customer success manager. RightSignature also provides priority support for their business and business plus customers as compared to the ones who signed up for the personal plan. Everybody can receive support by contacting them via email ([email protected] and [email protected]) or phone (800.921.4250). You can also submit an inquiry through their website. DocuSign offers a free 30-day trial to those who want to try it out before purchasing a paid subscription. No obligation or credit card is required to take advantage of this offer. Once you have signed up, your subscription will renew automatically until you let them know that you want to cancel. Note that if you sign up for an annual subscription, you have 30 days to request a full refund. If that time period has passed, you are locked in for the entire year. DocuSign’s individual plan, which allows you to send five documents for signature every month, costs $15 a month or $120 a year, an average of $10 a month. The professional plan, which provides the ability to send up to 10 documents on a monthly basis, costs $35 a month or $240 a year, an average of $20 a month. Two important features with the professional plan include the ability to utilize reusable templates and custom branding. More features and benefits can be obtained by purchasing the business plan ($50 a month or $360 a year, an average of $30 a month) or the business premium plan ($195 a month or $1,500 a year, an average of $125 a month). Individuals who need even more than what these latter plans offer can get the enterprise plan, which appears to be priced on a case-by-case basis depending on what services are required. DocuSign also offers special plans for realtors, which costs similarly to the lower-priced regular plans, and APIs, which start at $37.99 a month and $359.88 a year, an average of $29.99 a month, and go up from there.In fact, if you are involved with real estate, you should seriously consider going with DocuSign as this company has been a major provider to this industry for quite some time. However, do note that some involved with short sales have reported difficulty getting banks to accept DocuSign-provided signed documents but did achieve success when doing the same thing with RightSignature. Conversely, RightSignature’s offerings are a bit simpler. Its free trial is not time based as you can try out the service by sending up to five documents without cost. Otherwise, RightSignature’s personal plan costs $14 a month or $132 a year, an average of $11 a month. It allows one sender to send an unlimited number of documents. The business plan is $49 a month or $468 a year, an average of $39 a month. Those signing up for the business plan receive quite a few more benefits; these include the ability to use up to five templates, utilize five senders and create online forms. Meanwhile, the prices for business plus plans start at $1,188 a year, an average of $99 a month. All RightSignature plans come with a 30-day, money-back guarantee. However, the FAQs section of RightSignature’s website states that “RightSignature is a month-to-month subscription service,” which does not match up with its signup page that offers monthly and annual subscriptions, so the repercussions of cancelling an annual subscription are not clear. Of course, whether a certain plan works for you or not is dependent on your needs. If you are an individual who will be sending out a significant number of these every month but do not need to use a template, take advantage of RightSignature’s personal plan at $14 a month. However, if using a template would make sense financially and otherwise, but you will not need to send more than 10 documents every month, DocuSign’s professional plan at $35 a month would likely make the most sense. Next would be RightSignature’s business plan at $49 a month as this allows you to use five templates and send as many of these documents as you need every month. Other features such as company branding, integration API and bulk send start becoming available in the higher costing plans as well. As mentioned in the previous section, your personal verdict will obviously depend on exactly what you are looking for out of an e-signature service. However, RightSignature does just edge out in front for us, partly due to how easy it is to use. This includes from your vantage point, setting up one or more documents to send out to one or more people, as well from the perspective of those recipients and the fact that they do not have to download anything beforehand or be hit with advertising after having completed the process. That so much more is offered for its most basic membership and it’s slightly cheaper to boot also pushed RightSignature ahead of DocuSign for us. Nevertheless, you will need to take advantage of DocuSign’s impressive services if you must meet HIPAA regulations or appreciate being able to do things like quickly view a list of supported file formats. And, of course, DocuSign might simply end up being the right decision for you after you take into account exactly what you need from an e-signature company. But most people would probably be happiest with RightSignature.